Heat rashes occur to due exposure to heat or hot environments and usually cause itchy, red rashes on the skin. 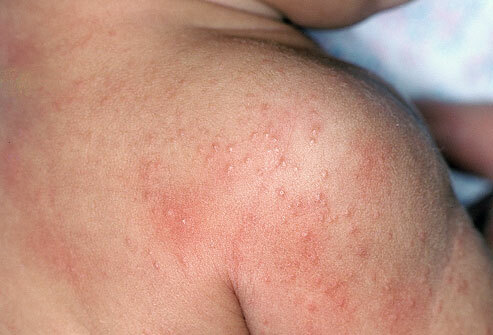 Heat rash occurs as a result of dead skin cells that block the sweat glands. This causes sweat to accumulate in the gland, beneath the skin. The build-up of sweat causes the sweat glands to enlarge and swell, thus causing a skin rash. Disclaimer: the material posted in this article is for information purposes only. Learn first aid and CPR techniques by taking workplace approved first aid training. Diagnosis for heat rash depends on physical examination in which the symptoms are discovered; therefore tests are not required to determine the presence of heat rash. Heat rashes can be uncomfortable, but they are usually non-serious conditions that can be treated at home. To learn more about heat related emergencies such as heat rashes and fevers enrol in workplace approved first aid training (sign up here).